Outrun the dragon chasing you! Tap to jump over obstacles! As always, the narratives and dialog in these Ratherjolly specials are one of a kind and top notch in the audio quality department! Great game! I feel like I was quite educated about the nature of hermit crabs after playing this wonderful game. I also like that our teams both choose the sea as part of our games, haha. Great minds think alike! This is absolutely brilliant! The voice acting is top notch. Seriously! It really gets me pumped to slap! Ha! Genuine reactions. And you found a bug with the text still clickable on game-over screens. Yup. A different dialog pops up. Nothing too fancy! Oh ho ho! Sir, the compliments do not just go to me and Adam. No no no no noooooo! The voice clips/dialog was recorded in my closet with my head surrounded by shirts while I spoke into my phone desperately. I could almost feel anxiety and depression of Humpty. Twas a dark time. Nonetheless!!! Your sick chiptune beats and depressing tunes helped set the mood for the game. We'll have to make a WebGL build of this and put the newer audio you sent over into the game. For the full effect, ya know? Glad we all had a chance to jam and get this Deb-inspired dialog sequence into game form. *tips hat in your direction* Good day, sir! You're not *technically* wrong. It has a horror game vibe going on. Where can I find one of these uni-brow trimming Capybara's like Barb? I need one...for personal reasons. *ahem* Yes. Quite. Heavily inspired by one of my previous games I made, Mobster Lobsters. 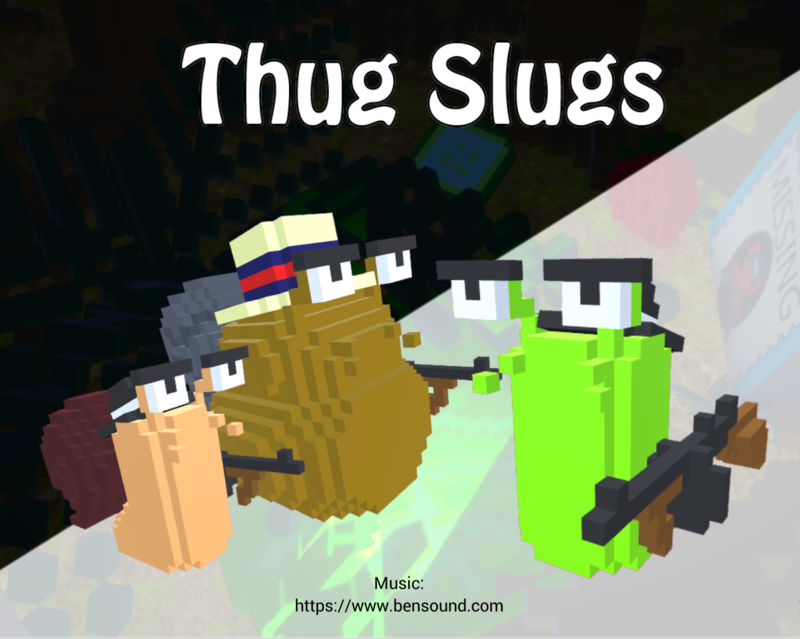 You take on the role of a Thug Slug this time. The name goes without saying, you are up to no good. You and your cousin, Sheldon, got in a fight over who can horde all the grub left in the woods. Now you gotta take out your cousin and his gang, The Bail Snails, to make sure they don't invade your turf and steal your food! Tommy gun 'em down with salt pellets and defend your turf! Slugs VS Snails! You think you got what it takes? Slug it out! On a side note, I didn't get all the features in that I wanted, but I'm pretty proud of all the work I accomplished in a short amount of time! Head bobbin' to the music. Hammering away. Reminded me of Fantasy Life (like some other folks said). Really well done for a jam game! Fixed the level select bug! Now you should be able to see the levels and you can slash them to load the one you want. Sorry for the delay! ENJOY SLASHING! Thanks for the feedback! Taking it all into consideration. I am posting a new version which will focus on using your mouse to aim and your keyboard to move. I played through a lot recently to refresh my mind on how it all plays out. Hitboxes are a tad bit wonky in places, I agree. I appreciate your honesty and that you took the time to play it! Very peaceful game. The music, the ambience, the sound fx. Everything just makes you feel like you are out in an open sea casting your line into the open waters. It took a bit of getting used to even after reading the controls. The hardest part was finding the right time to hit the arrow keys (like DDR) to match the rhythm to catch the fish. I did manage a score of 160 points!